Although the role of high-pass filters (HPF) in echo cancellation is secondary when compared to roles of major functional blocks, it is sometimes ignored and, as a result, the echo cancellation product does not perform according to expectations. Motivation for placing HPF on the paths to the adaptive filter and to the summation node (so, essentially, placing it in the send direction) is multifold. Some reasons motivating the use of HPF are based only on general preference without pointing to specific tangible advantage, Other reasons are well justified based on the functionality and performance of the echo canceller. First off, typically the frequency band of interest for NB communication is [300 Hz, 3400Hz] and for WB is [50 Hz,7000 Hz], approximately. A general view on the evolution of HD voice with emphasis on mobile telecommunication is shown in Figure 1. It is observed that the adaptive filters works better in a band-limited frequency range as opposed to the full range limited only by the Nyquist frequency. Of course one might argue that the signals coming to the echo cancellers are already filtered. This is true in many (perhaps in majority) cases. However, often the echo canceller is exposed to very low-frequencies as well to signals with DC offset. The DC offsets are produced by several different circumstances, of which two are worth mentioning here. One of them is G.711 a-law asymmetric coding/decoding. The offset is minor yet it is always present unless there is a HPF on the signal path to remove it. Some microphones tend to produce DC offset. It has been observed that often digital microphones (i.e., PWM-microphones) tend to produce a DC offset (not necessarily by design). Therefore, one might say, that the role of HPF is merely limited to additional protection against unwanted effects. Yet, there are other reasons as well; for example, removal of very low frequencies from input signals to the DTD block tend to improve its performance by reducing instances of false double-talk detections. 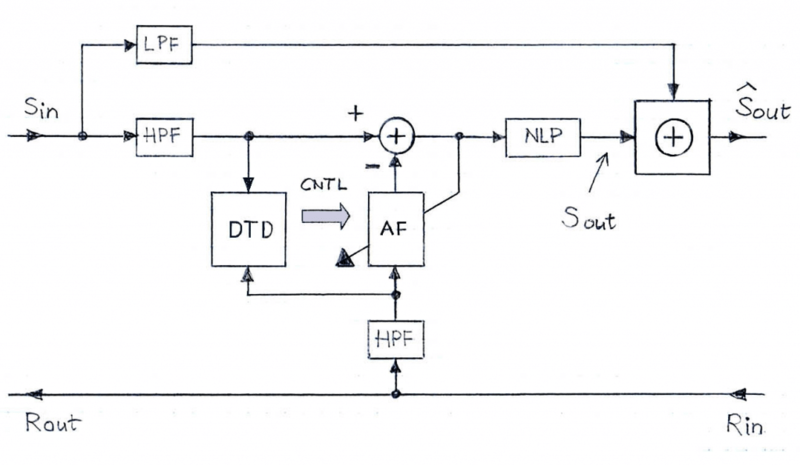 Therefore, there are valid technical arguments for the placement of HPF and they go beyond providing an extra protection from the viewpoint of input signals of an echo canceller, but also to facilitate operations of the other functional blocks such as DTD, AF and NLP. A subsequent question is about of the type of HPF to use in this application. Since a FIR filter can be of exactly linear phase, then the general preference might indicate that this is the right choice. However, IIR HP filters are practically preferable because they are less computationally expensive. Since they are to be placed around the AF block in a symmetrical fashion, they do not change the mutual time relationships between the two inputs to the summation node. In Figure 2, two block diagrams, (a) and (b), of an echo canceller equipped with a high-pass filter are depicted. While they are equivalent from the viewpoint of the adaptive filter when operating in the single-talk mode, the version shown in Figure (b) is preferred as the DTD operation is not affected by the low-frequency components that are irrelevant in most applications. In some network installations, it is strongly preferred that the bandwidth of the up-stream and down-stream signals is not affected through permanent removal of any frequency sub-band within the entire voice channel bandwidth. For these installations neither of these versions ( i.e., neither Figure 2 (a) nor (b)) meets that requirement. In Figure 3, a version with a low-frequency by-pass is shown in which the HPF is constrained to echo cancellation operations only. VOCAL Technologies’ echo cancellation solutions can be configured in a flexible fashion with any of the specific system arrangements described offered as a custom solution. Please contact us to discuss your echo canceller application requirements.